Mobile RDC Fees: One for the Psychology Books? By Jeff HempkerEditor’s note: The following commentary piece by Digital Check appeared on the Bank Innovation news site on April 19. An earlier editorial on that site had posed the question of whether consumers would be willing to pay a nominal fee for mobile remote deposit capture. We followed up with our thoughts on why this may be a tough sell for banks, even if they are in fact offering excellent value. Banks have a point that 50 cents is not much to pay for the time mobile deposits save – but will consumers listen? 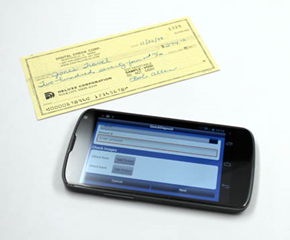 Should mobile remote deposit capture (RDC) be free? That’s the question people are asking again after comments made this month by Regions Bank and PNC indicating that they respectively plan to charge for the service, or have at least considered doing so. This may not be the kind of thing that’s going to generate a consumer backlash on the level of, say, overdraft fees or monthly debit card charges – but it does bring up an important question for banks: What, exactly, is RDC supposed to be? A cost saver and revenue generator that pays its own way? Or an act of charity that makes up for its cost through that ever-important but hard-to-quantify metric, customer goodwill? Now, there’s obviously a big difference in willingness to pay for RDC between, say, a business that takes in 500 checks every week, versus an individual consumer who wants to deposit a rebate check once a month. For the business, it’s a straightforward calculus: RDC saves you real employee hours and real money, so if that’s more than the cost of the service, then you’re willing to pay for it. But for consumers, the dollars-and-cents motivation to use RDC is not as obvious. They’re not paying an employee to balance their books, they’re not going to use the time they save to earn extra money, and it’s probably not going to kill them to hold on to a check until the next time they’re near the bank anyway. So once you get past the novelty of “Hey, look what I can do with my smartphone now,” your pitch is that they should take on a new expense for the sake of personal convenience. Which is not necessarily a bad thing. Regions Bank is absolutely right when it says that a $0.50 fee for mobile RDC is more than reasonable once you consider the time and trouble it would take to deposit the check otherwise – and there has been research that backs that up. In a 2011 presentation on mobile banking, ProfitStars’ Lee Wetherington cited a Siegel+Gale study concluding that “U.S. consumers will pay a 4% premium for simplicity.” So in theory at least, a $0.50 fee for remote deposit ought to seem reasonable for any check over $12.50. The trouble, though, is that from the consumer’s perspective, we’re not talking about raising the price of something that already costs money – we’re talking about charging for something that they’ve become accustomed to expect for free, or for which they perceive there exist free alternatives such as ATMs. And as countless examples such as the Washington, D.C. 5-cent bag tax have shown, the lower the starting point for cost, the harder the customer will fight over every penny. In a 1989 book entitled Decision Traps, Cornell professor J. Edward Russo performed an interesting experiment about the way people value money. One group of volunteers was asked to pretend they were shopping for a $50 radio, and were then told that an identical model was on sale for $25 at a store 10 blocks away. A second group was asked to pretend they were shopping for a $1,500 stereo that was on sale for $1,475 at a store 10 blocks away. Even though the outcome in each case was essentially the same – walk 10 blocks to save $25 – three-quarters of the volunteers said they would go to the other store for the $25 radio, but hardly anybody said they would bother for the $1,475 stereo. Does this behavior translate all the way into the nickel-and-dime range we’re talking about with mobile transactions? To answer that, all I have to do is go up the street to my local Costco, where every weekend a line of cars 20 minutes long snakes through the parking lot leading up to the gas pumps. It’s true that Costco sells the cheapest gas in town – but literally right across the street is an ARCO station with no line and prices just 2-3 cents per gallon higher. Assuming the average customer wants a generous 10 gallons of gas, they’re willing to wait almost half an hour to save maybe 30 cents. Almost 25 years later, Russo’s study is still right – and in fact, when you get down to the level of microtransactions, consumers’ willingness to put up with inconvenience in order to save a buck is nothing short of amazing. Is it a productive use of your time to spend 20 minutes fighting over a quarter? Probably not. Do people do it anyway? All the time. Regions has an excellent point when it says a $0.50 fee is a great value for the hassle it saves. But convincing people of that can be an uphill battle. One thing the banks do have going for them is the opportunity to educate. People might go to extreme lengths to save a few pennies on the spur of the moment, but illustrating the tradeoff in advance can help break bad habits. Your initial reaction might be that any chance to save 50 cents is worth it … but if I offered you a job running errands for me in your spare time, at a wage of $1.20 an hour, would you be likely to take it? The ultimate success of fee-for-RDC apps is going to depend on whether the banks can broadcast the benefits loudly and clearly enough to overcome their customers’ natural tendency to resist fees. But whether it works or not, they can probably take comfort in the fact that those $0.50 are probably not going to cause customers to bolt out the door – if it’s too big of a turn-off, they won’t switch banks; they just won’t use it. Because the clock-radio experiment also proved another point: If there’s one force that can compete with consumers’ tendency to be frugal, its inertia. This article appeared on the Bank Innovation news site.